St. Charles Ornaments are HERE! ‘Tis the season for cookies, light displays, and tree decorating! Add some school spirit to your Christmas tree this year with a St. Charles ornament. We are excited to announce this new and limited-supply item available for purchase in December. Home and School will be selling the ornaments at the Family Movie Day this Sunday as well as after all Masses in December. You can purchase an ornament for $10.00 each, or buy 2 for $18.00. We had a very generous donor come forward who purchased the ornaments, so ALL proceeds from the ornament sales will go to the Staff Appreciation Fund, which gets distributed to teachers and staff before Christmas break. 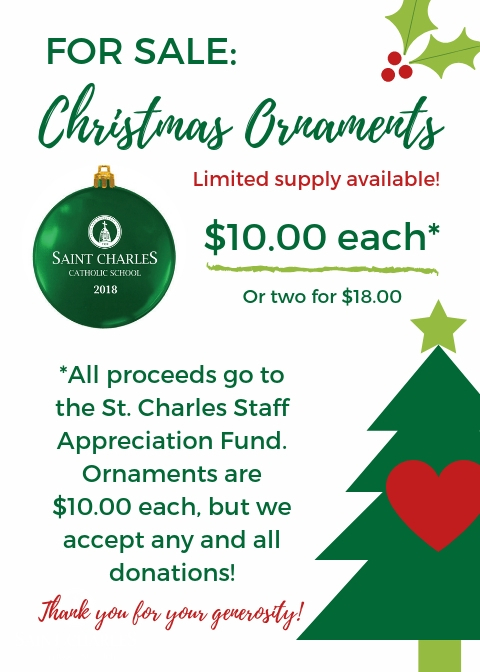 Please stop by one of the sales to buy your St. Charles ornament!